The Pennsylvania Department of Human Services designated Centers of Excellence (COE) across the state to implement programs to address the opioid crisis. 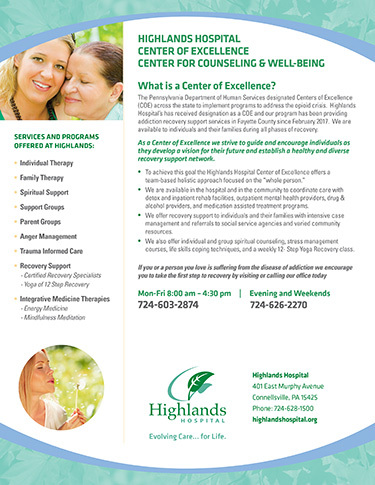 Highlands Hospital’s has received designation as a COE and our program has been providing addiction recovery support services in Fayette County since February 2017. 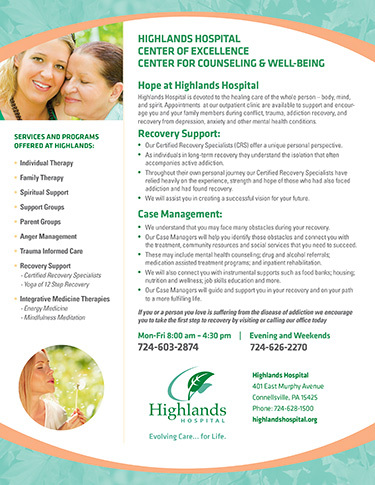 We are available to individuals and their families during all phases of recovery. As a Center of Excellence we strive to guide and encourage individuals as they develop a vision for their future and establish a healthy and diverse recovery support network. • We are available in the hospital and in the community to coordinate care with detox and inpatient rehab facilities, outpatient mental health providers, drug & alcohol providers, and medication assisted treatment programs. • We offer recovery support to individuals and their families with intensive case management and referrals to social service agencies and varied community resources. • We also offer individual and group spiritual counseling, stress management courses, life skills coping techniques, and a weekly 12- Step Yoga Recovery class. If you or a person you love is suffering from the disease of addiction we encourage you to take the first step to recovery by visiting or calling our office today. This program explores the opioid crisis in Western Pennsylvania. People who have experienced addiction, either themselves or through a loved one, share their stories of struggle, stigma and loss. But they also show how they’ve managed to use their pain as a catalyst for change, providing hope for others. Y12SR – The Yoga of 12-Step Recovery combines the practical tools of the 12-step program with the ancient wisdom of yoga.